OK friends! The time has come for us to move into our new digs! We are still tweaking things, and fixing the things that aren't working (there are a few). Make sure you update your reader with our new blog address! I think it was only 3 days ago that I remembered that December was coming and the kids would be expecting something fun and exciting to happen. You see, each year I try and come up with little daily surprises for my kids to help them get ready for MY favorite holiday. Mostly because I have 4 younger kids that would fight over who got to open the thingy each day. This year they get to rotate what they open each morning. The first calendar I made years ago. It is a wonky little tree with pockets. Each day you move the Star closer and closer to the top of the tree. This next one is snack pockets. I loaded each pouch with 4 small treats, one for each kid. I put up envelopes on for the weekend days. They will hold a note about special breakfasts, or fun deserts for lunch. 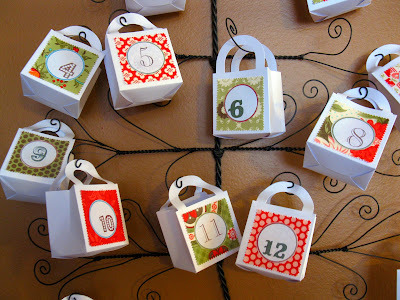 For the Third- Little gift bags that hold notes about a different Christmas activity each evening. The 4th is my favorite! 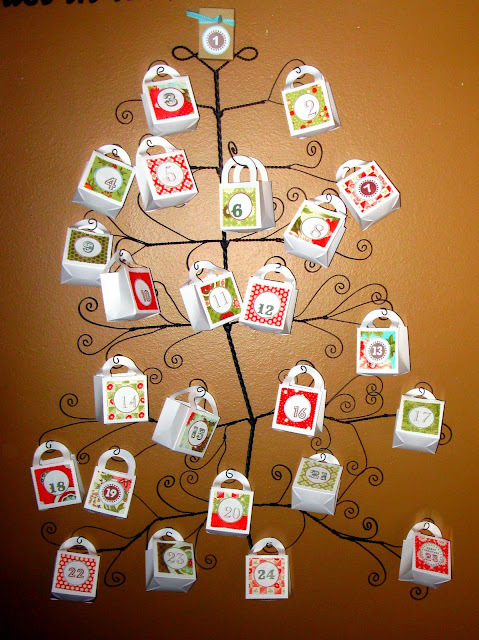 I got a Christmas card holder shaped like a tree. On it I hung little gift boxes with bits of Bliss fabric on them. I printed off the cute little number circles from a cute little blog that I can't seem to find right now, but I will update this when I do. Inside each box is a daily challenge. The challenges are things that will mostly help us learn to serve others. *Tell your teachers "Thank You"
Each night we close our day talking about what we did for others today, and with a Scripture story about the Saviors life to help us prepare for the celebration of his birth. 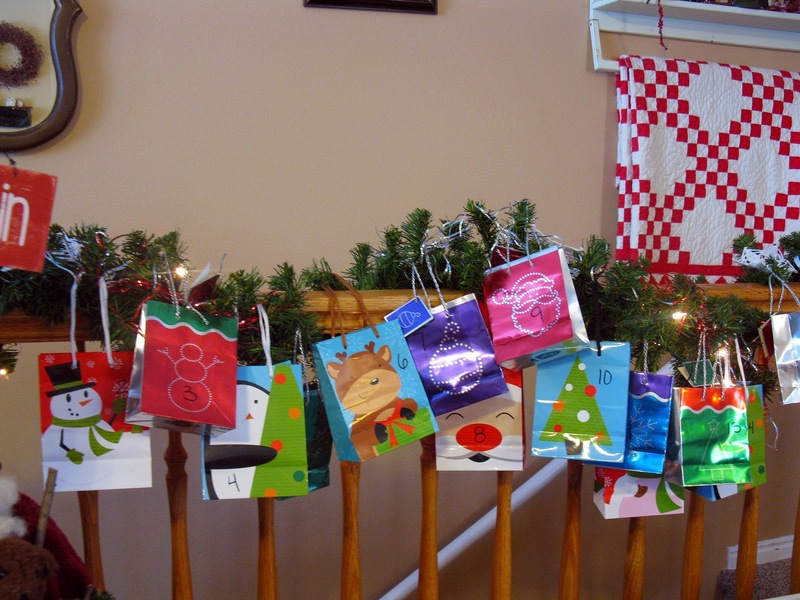 What do you do with your kids for Christmas fun? Look at what we woke up to. Freezing weather, bundled kids, hot chocolate, Christmas lights, goodies, music, presents, shopping and lots and lots of sewing. Here is my nine year old shoveling our sidewalk before school. She got tired. Happy Holidays and Happy Sewing!!!!! We are so grateful for you! Thank you for your support, kindness and encouragement. I truly believe that the world is a much more beautiful place when people use their talents and create. Like most sewers we are sure that your creations end up in the hands of those you love and care about. Crafters by nature are selfless, giving and have really BIG OL' hearts. How lucky are we to "know" you and consider you our friends and sisters! No matter what God, or Higher Power you believe in, this time of year is so special as we reflect on things that are bigger than we are. It is a time of giving and holding those special people and memories close to our hearts. This time of year also reminds us to be thankful and look out for those that are less fortunate. 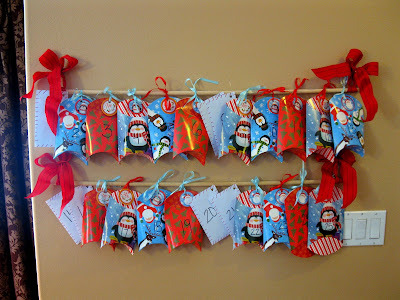 I am always amazed at the ideas, hours and money crafters are willing to give to others all year. We love to give our creations to others to bring them joy or comfort, most of you do not wait to be asked. The need arises and there you are, willing, waiting and most of all excited! I personally can't imagine a better genre of friends to have, I know that I have many ladies that one single phone call and my problem is solved. Whether that involves making 22 minke blankets (yes, 22) for the seniors on my son's football team, shuttling kids, binding a quilt, testing patterns and the list goes on and on. So thank you for you being simply you! Your efforts do not go unnoticed or unappreciated, you are examples of what this world needs. I believe God gives talents to those who will use them to do His work, you are blessed with a talent, whether you're just learning or an expert seamstress, you were given the desire to create for a reason. Whether it's to bring comfort, joy or beauty it all serves a purpose. May this holiday weekend and the holidays right around the corner find you safe, warm, surrounded by those you love and fabric up to your ears :o) We are so grateful and thankful for your friendship. Happy Thanksgiving y'all! 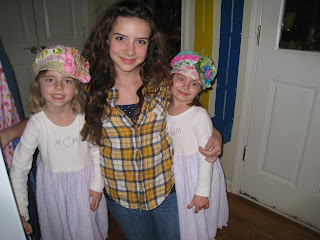 Danielle...I am sewing 18" doll clothes, some hand bags, Christmas dresses for my girls, and a few scarves for myself. I love these banners. I have one that is over 60 feet long. 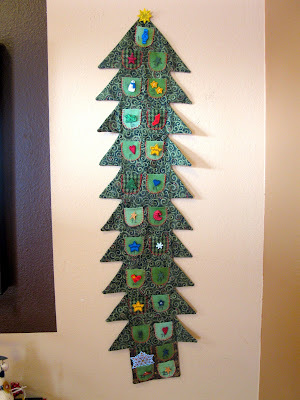 Our kids love it when it is hanging in our dining room, draped from corner to corner, criss crossing all over the room. Festive! Please drop us a line Danielle with your mailing address and we'll get those right out to you! It's the most wonderful time of the year...FREE alphabet PDF for a Christmas banner! Cute, right? I know, I really love it! This weekend my goal is to have my house somewhat decorated for Christmas. You can download the PDF for the alphabet here. It is reversed and ready to go (you're welcome). I made a banner, but honestly, the possibilities are endless. Felt I had a piece that was about a yard, it was oodles. Depending on what word or phrase you use will determine your quantity needed. 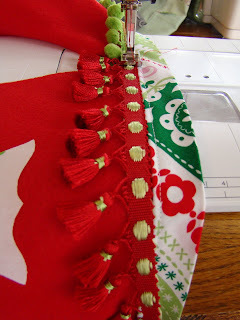 Fabric for the applique. I used 1/3 yd., but again you might need more or less. Fabric for the thingamadingy at the top (can't for the life of me think of what it is really called...must be late). I bought enough to cut the strips on the bias. Bias tape would work also. Ric rac, ribbon, pompoms and any other doodad you wanna put on these beauties. 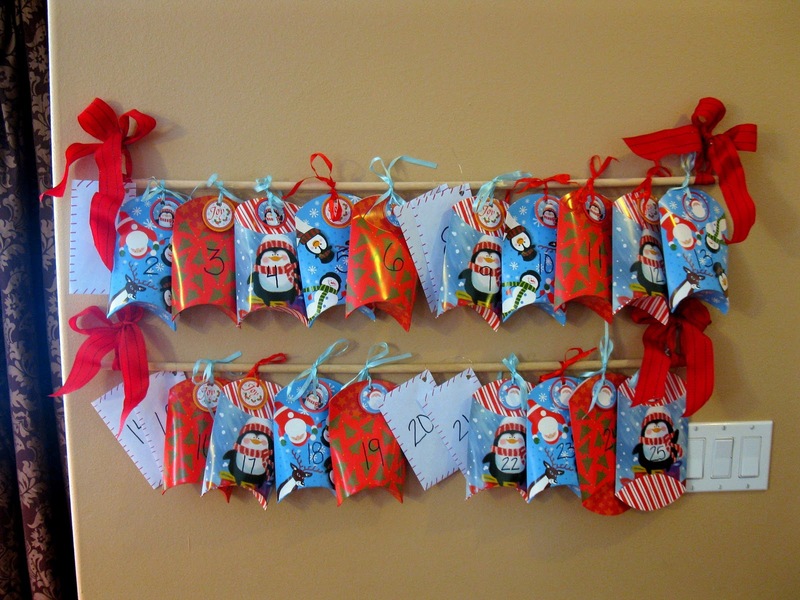 Jingle bells, I bought the big ones, because my banner is quite large. Trace your letters onto the Heat-N-Bond. We reversed everything already (your welcome yet again). 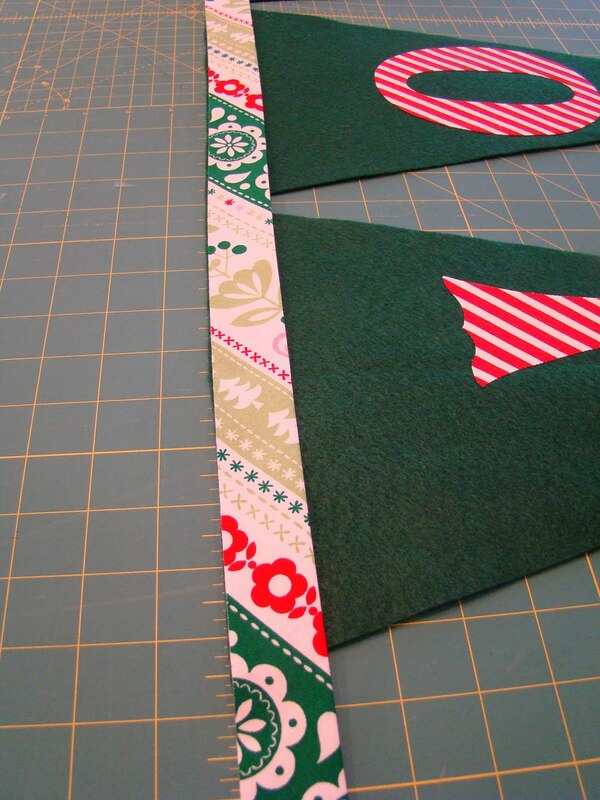 Iron the pieces to the WRONG side of your fabric. Cut it out and peel off the back. Iron the letters to the pennants. Make sure you use the acrylic setting, felt melts, unless you are using real wool or bamboo felt. I hit mine with a little steam. Now this is how I cut out my pennant, listen and read carefully. (Sorry the image isn't rotated). If you are not going to change the size of the letters then do what I did. 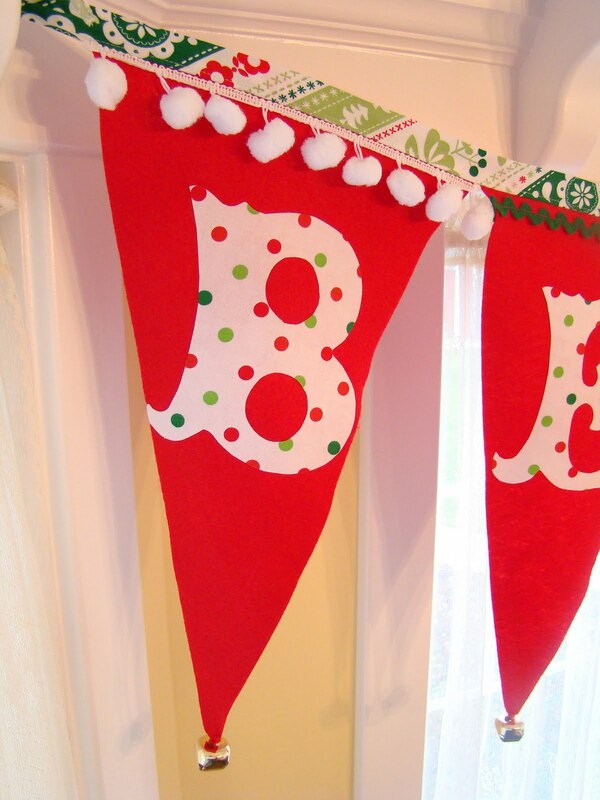 If you do change it, good for you and good luck figuring out how big to make your pennant. I took a 10" strip of the felt, found the center and measured and marked down 17". I took my ruler and lined it up at the top of the 10" strip and the mark, then I cut it and repeated it for the other side. Then I used that triangle to make the other six I needed. Was that awesome geometry or what?!?! Hey, it worked. Mr. Anderson would be so proud...not. Line up your pennants right next to each other. Cut your thingamadingy strips 2.5" inches wide, piece them together if needed. Iron the strips in half with wrong sides together, like binding for a quilt. Yes, you are looking at another banner, this is my bratty little sister's (nah, she's sweet). 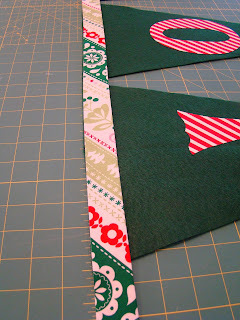 Lay the thingamadingy strip on the right side of the pennants with the raw edge lining up with the top of the pennants. Pin well. Sew with 1/4" seam. Iron the strip up and away from the pennant. Topstitch, you can see my gorgeous topstitching below, I love to topstitch, weird huh? Merry Almost Christmas (36 days left)!!! Tell us what's on your sewing to do list this next week and we'll randomly pick someone for a free pattern bundle of all our bags!!! Jack's teacher doesn't hand out those books, the librarian does. I contacted the principle and explained to him the situation, he was very concerned. I informed him that the book would not be returned, it has been thrown away. He said that they would go thru all the books in the weekly readers and make sure that all books were appropriate. He apologized profusely and thanked me for bringing this to his attention. I feel much better! Now on to stuff that is fun! We will posting a really cute tut on Friday, be sure to check it out.